God can be attained by absorption of the mind in Him with any emotion, whether it be lust, anger, fear, affection, friendship or love. Therefore, one whose mind is totally absorbed in God, even through enmity, attains Him and is liberated from maya. To call such a person a non-believer only reveals one's own lack of faith in God. Besides this, we have to accept the existence of god as the dispenser of the fruits of actions performed by individual soul, because actions are insentient. They cannot bear fruits on their own. 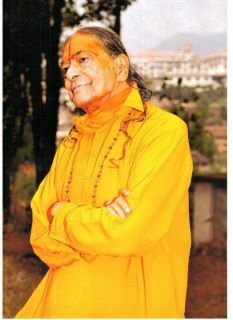 The work of awarding the results of actions at the appropriate time can only be performed by an omniscient personality. Firstly, the individual soul is ignorant. He does not possess knowledge of the actions performed by him in countless past lives. Secondly, if he did have this knowledge, why would he desire to suffer the consequences of his own actions? Therefore, God has to be accepted as the dispenser of the fruits of actions. Even the Nyaya system of philosophy supports this view. In reality, the existence of God cannot wholly be proved by either perceptual or inferential evidence. Hence, the Vedanta system of philosophy has proved the existence of God by means of scriptural testimony only. Generally, naive people claim that scriptural testimony is ordinary evidence. Only evidence through experience is acceptable as proof. But such people should bear in mind the fact that experience is gained only after spiritual practice and prior to spiritual practice, the words of the scriptures will have to be accepted. Further, if practical experience alone is accepted as proof, then all the actions of the world will be disproved. For example, a person suffering from jaundice sees the color of a white object as yellow; a person bitten by a snake finds the taste of the bitter neem leaf to be sweet; an ant with a grain of salt in its mouth, wanders around a mountain of sugar, experience is imperfect or incomplete, it can be misleading. Therefore, it is only by means of scriptural evidence that the actual truth can be realized. If by practice of spiritual discipline as specified by the scriptures we fail to realize God, then and only then, we have the right to say that there is no God. Now we have accept the existence of God, but he may question the purpose or necessity of worshipping Him. We could argue that just as we have a President in a country, God may be the President of the entire universe; but why do we need to worship Him? Such an argument is naive because our relations with the President of the country are limited and formal, whereas our relations with God are complete, loving and eternal. Further, we are selfish by nature. We are naturally attached to whoever or whatever fulfils our self-interest. This is an experienced fact. We all desire true, everlasting, unlimited happiness and that happiness is only in God. Therefore. Our most intimate and only relationship is with God. If we could attain even an iota of happiness elsewhere, then our relations with God would have been the same as that with the President of the country. However, you don’t need to worry about attaining God. He is easily attainable. I can assure you that you do not have to engage in any spiritual discipline to realize Him. You may argue, “if we do not have to engage in spiritual discipline, how is it that we have not yet attained Divine Bliss?” Yes, this is a valid question. That is just what needs to be understood. Have a little patience and you will understand everything. “Having acquired a human body if we do not realize God, we will have to suffer in the endless cycle of birth and death.” This will be our greatest mistake. Therefore, realizing the importance of the human form, we must acquire knowledge of God so that we can attain our absolute, ultimate goal of Supreme Bliss.